Hanoi (VNA) – The project “Vietnam’s Supporting Industries to Europe” has improved manufacturing capacity of the sector after three years of implementation. During a seminar held in Hanoi on May 29 to review the project, Director of the Supporting Industry Enterprises Development Centre (SIDEC) Truong Thi Chi Binh said among more than 200 participating enterprises, 98 percent of them have increased sales while 38 percent have recorded higher export earnings. The project has connected spare parts manufacturers with buyers worldwide, particularly those in the European market, and assisted in building relevant policies. Thanks to the project’s support, the Vietnam Association for Support Industries (VASI) was born in March 2017 which links together businesses, organisations and individuals working in the field. Up to 30 training courses in manufacturing-trade have benefited 1,500 people while 67 stalls were organised for businesses in eight international fairs in Europe. Do Thi Thuy Huong from the Vietnam Electronics Industries Association said the project has made it easier for Vietnamese firms to supply products to Samsung. Participants suggested ministries and agencies concerned offer support in training, connectivity and joining international fairs. According to Binh, Vietnam is strong in products requiring both machinery and hand assembling, such as electronic circuit which is sold well at international fairs. The government was urged to offer incentives to businesses regarding loans, technology and training in order to facilitate Vietnam-European Union (EU) trade. The VASI also needs to improve its consultancy capacity and training for manufacturing firms. 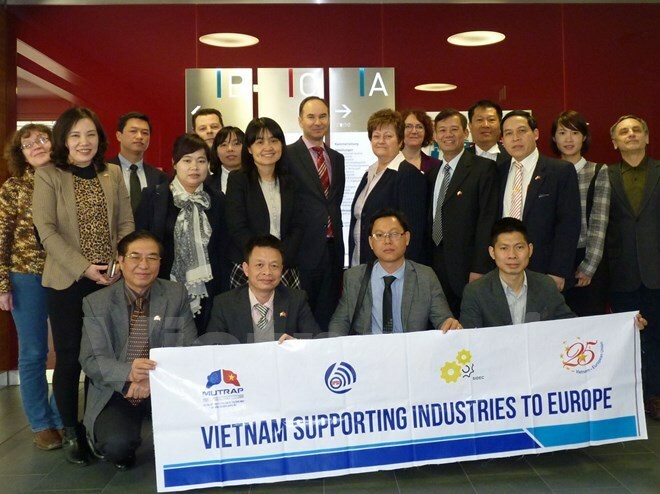 The “Vietnam’s Supporting Industries to Europe” project was funded by the EU with a total cost of more than 412,000 EUR.